This entry was posted in Uncategorized and tagged Bangkok, culture, Krungthep, Thailand, Utilities by christao408. Bookmark the permalink. I cringe. As an occupational health and safety coordinator I see so much wrong with this that I’m sure to have bad dreams! I don’t suppose that they limit this work to men with terminal diseases and no family? I’m just glad this wouldn’t fly in the US. That looks so dangerous. I am worried like Val is above. Now, why don’t I find this odd! Similar fundamentals….as I was at one of the crocodile zoos in Thailand, the performer wears no protective clothing at all while putting his/hers arm or head into the crocodile’s mouth. That’s just crazy. I do love OMD though. what?! that’s insane! it’s a good thing he didn’t get shocked… squirrels occasionally get shocked on the power lines because the lines aren’t insulated. @Dezinerdreams – Hmm… I wonder… =P@kunhuo42 – Perhaps the power lines are higher and those are just phone and cable? @chow@ireallylikefood – You know, the first concert I ever went to was the Thompson Twins at the Oakland Colesium, with OMD as the opening act. @CurryPuffy – That’s part of the show, though. This was just mundane, day-to-date craziness. @ElusiveWords – The reaction of someone who is being too farang. LOL@murisopsis – @ZSA_MD – Had I asked, I’m sure they would have explained how it was perfectly safe! Hi Chris, usually I’ve seen them do it more professionally than this! In a few years though, all those wires would be underground.. I think Thonglor is next on the list. 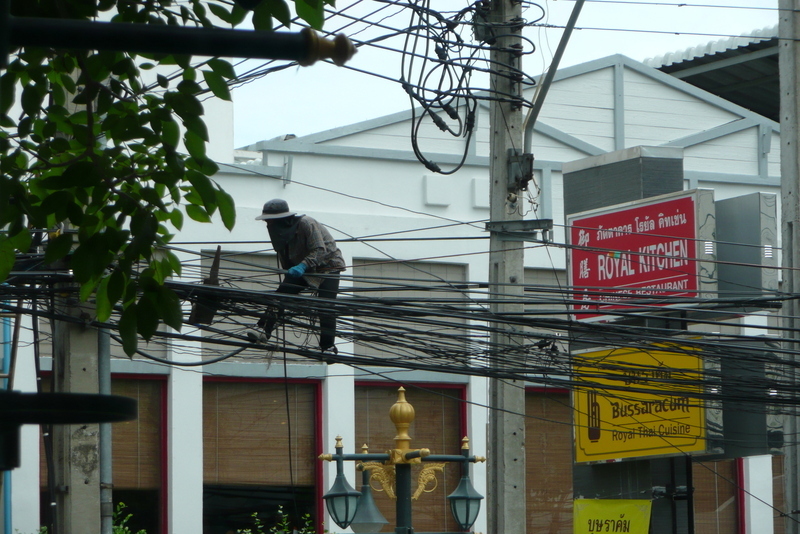 Right now they’re doing parts of Sukhumvit. @Poom – Really? They’re going underground? I would think the logistics of that would be tremendously difficult, given both the low elevation relative to the water table as well as the haphazard way with which new lines are added. I certainly wouldn’t complain if they did get that project done. It would make the city much more beautiful.